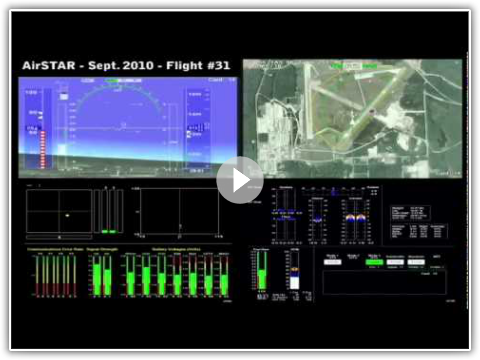 The IRAC Project (2007-2010) was created by the NASA Aviation Safety Program and had as one of its primary objectives to advance and transition adaptive flight control technologies as a means of increasing aviation safety. To this end, NASA developed the AirSTAR Flight Test Facility, integral part of which is the GTM aircraft. The GTM is a remotely piloted, twin-turbine-powered, and dynamically scaled model of a civil transport aircraft, designed to provide a flexible research environment with the ability to conduct rapid prototyping and testing for control algorithms in extremely adverse flight conditions, such as in-flight failure emulation and flight at high risk upset conditions. Research pilot Dan Murri controls the AirSTAR GTM from inside the MOS. Looking on is flight test director Kevin Cunningham. As part of the IRAC Project, an L1 flight control system was flight tested on the NASA’s GTM aircraft. 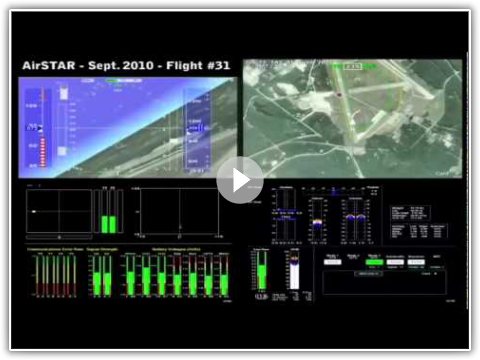 The L1 flight control system was flown at the NASA Wallops Flight Facility, VA, in September 2009, and at Fort Pickett, VA, in March, June, and September 2010, and in May 2011. The L1 flight control system designed for this application consisted of a non-adaptive stability augmentation system (SAS) for pitch and roll, and a three-axes angle-of-attack, roll-rate, and angle-of-sideslip adaptive command augmentation system (CAS). The L1 adaptive controller was thus providing command tracking capabilities in both nominal and off-nominal conditions as there was no CAS baseline to assist it. Moreover, a single set of control parameters was used for the adaptive controller throughout the flight envelope. Only the reference model was scheduled in order to specify different performance requirements at different flight regimes, such as stall and post-stall. NASA has recognized these tests as the first successful flights of an all-adaptive CAS that deals with aircraft stability degradation and control surface failures with a pilot in the loop. L1 flight control architecture for the NASA AirSTAR vehicle (simplified). The results of the flight tests demonstrated that, in the presence of aircraft component failure and significant changes in aircraft dynamics, the L1 flight control system is able to maintain aircraft safe operation and predictable performance with reduced pilot workload during both standard flight conditions and unusual flight regimes, like stall and post-stall. For instance, the L1 flight control system was able to maintain desired performance for a 75% simultaneous degradation in longitudinal and lateral aerodynamic stability with an additional 50% reduction in pitch-control authority, showing a graceful degradation for the cases of 100% and 125% simultaneous stability degradation. Moreover, with the L1 flight control system, the pilot was able to attain stable controlled flight in stall and post-stall regimes in spite of the highly uncertain and aggressive pitch break and roll-off phenomena that make the unassisted aircraft unflyable in these flight regimes. To date, the L1 flight control law is the only control law that has flown in the high angle-of-attack, post-stall regime on this NASA research aircraft. The L1 flight control law is currently being used at NASA LaRC to support unsteady aerodynamic modeling work at challenging flight conditions and also has enabled real-time dynamic modeling of the departure-prone edges of the flight envelope. The L1 control law supports these modeling tasks by allowing the research pilot to operate the aircraft in precarious flight conditions near stall and departure for longer periods of time, which provides time for the optimized multi-input wavetrains to excite the aircraft dynamics in all 6DOF to collect the data needed for real-time dynamic modeling. L1 control in support of modeling tasks: Post-stall AOA step tracking. L1 control in support of angle-of-sideslip vane calibration. L1 adaptive control for post-stall control. Gregory, Xargay, Cao, and Hovakimyan, “L1 Adaptive Control Law in Support of Large Flight Envelope Modeling Work,” in CEAS Conference on Guidance, Navigation and Control, Munich, Germany, April 2011.